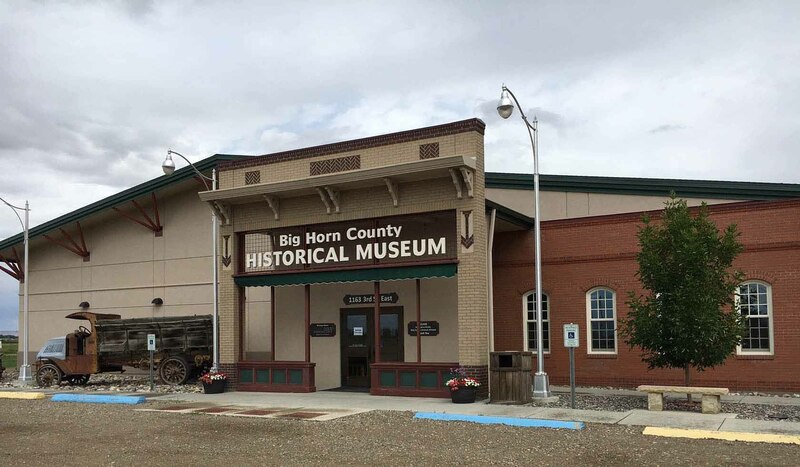 The Big Horn County Historical Museum is Montana's largest historical museum, located just off I-90 Exit 497 one mile east of Hardin, only 12 miles from the famous Battle of the Little Bighorn and is home of the Will James Studio. The Big Horn County Historical Museum opened in 1979 when volunteers restored the 1910 farmhouse located on the 22 acre vegetable farm. Through the years the museum has grown from one historic structure to 26 significant historic buildings that were moved to the property from various locations in the county. In 1981, a building was built to house the office, gift shop, public restrooms, and an information center, offer a gallery for rotating exhibits and provide storage. Later two barn style structures were built on site to exhibit the growing collection of farm equipment, horse drawn wagons and antique vehicles. In the spring of 2012, a new state-of-the art main building was completed. The facility features a large gallery, gift shop, library, program/educational room, offices and the State of Montana Visitor Center. The museum has become a focal point for our area’s rich culture and provides facilities for community gatherings and educational experiences. Travelers from around the world tour the complex. The continuing development of the Big Horn County Historical Museum is testimony to the commitment and strength of the relationship of volunteers, society members, the community, and city and county government to preserve the heritage of our area. We believe your visit to the Big Horn County Historical Museum will be both enjoyable and educational and we encourage you to be our guest.